With just a box label to go on, it can be very difficult to learn just what’s in your horse’s supplements and why it makes a difference. 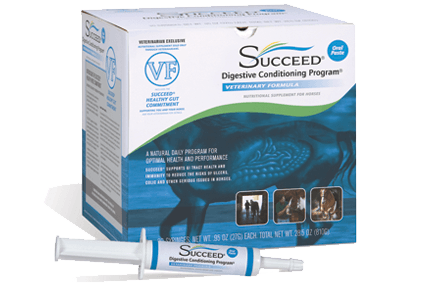 In Part 1 of this series, What Goes In SUCCEED®, we explained how equine supplements are regulated and how that affects our label. In Part 2 we will will discuss the benefits of the Oat Flour (it’s in the high beta glucan content) in SUCCEED. Subscribe to the blog for parts 3-5 on the benefits of what’s really in the oat oil and irradiated dried yeast on our label – and the synergy of these ingredients in SUCCEED. Thanks to state feed regulations and AAFCO, we have to list oat flour as an active ingredient in SUCCEED. But what’s useful in the product is really the high concentration of beta glucan in our flour. Beta glucan is the soluble fiber that come from oats, and it’s not something you’ll find in meaningful amounts in the oat flour you find on your store shelf. Supports immune health – Keeping the horse’s immune system in high gear is important for overall health, especially for horses under the stressful conditions of performance and training, and helps keep the horse’s normal, healthy bacterial environment in balance. Forms a hydrogel in the stomach that helps moderate the transit speed of feed matter through the digestive tract – this is especially important for horses with grain in their diet. Processed grain feeds are rich in simple carbohydrates (sugars) and are often consumed quickly. When simple carbohydrates reach the hindgut undigested, they can be fermented by the hindgut bacteria that normally digest the structural carbohydrate in grass, the horse’s natural diet. Fermentation of simple sugars in grain can result in hindgut acidosis. By reducing the rate at which these simple sugars move through the intestines, there’s more time for those sugars to be digested and absorbed there, so they are less likely to reach the hindgut. Regulates the release of sugar into the bloodstream – given the significant amount of sugars in processed grain feed, and that we feed horses two or three times a day, we can induce the same sugar highs and lows we see in kids after they eat candy. 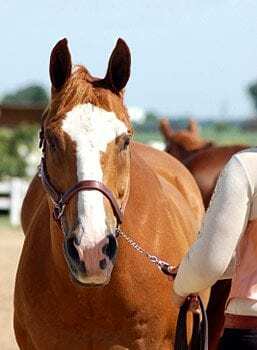 This can affect a horse’s attitude and can make your post-feeding training regimen a challenge. By moderating the release of sugars, you can reduce these highs and lows for a more even temperament. In short, this means that a horse’s food has more time to digest properly in the foregut without passing starches and sugars to the hindgut. So, if all oats are rich in beta glucan, can’t we just feed our horses oats or add a cup of oat flour a day to get the same benefits? The truth is, oat flour you see in the grocery store doesn’t come close to including the concentration of beta glucan that’s in the oat flour in SUCCEED. Worse, store-bought oat flour can be downright bad for horses because it’s full of the starches. Oats contain both bran and starch. Horses need the bran that is rich in beta glucan – not the starch that their digestive systems aren’t designed to digest. The oats used in the production of SUCCEED are different than those used to create most flours. Our oats have more bran, which is rich in beta glucan, and a low starch content. Oats used for most flours and have a much higher starch content and less of the beta glucan-rich bran. When generic oat components are separated to produce flour, what actually ends up on the store shelves is primarily the inside of the oat – the part that is high in starch and low in beta glucan. On the other hand, the oat flour in SUCCEED is made by separating out the more beta glucan rich parts of the oat. The beta glucan content of an oat is only about 4%. The special oats and our unique processing increase the concentration of beta glucan in the oat flour in SUCCEED to 14%. 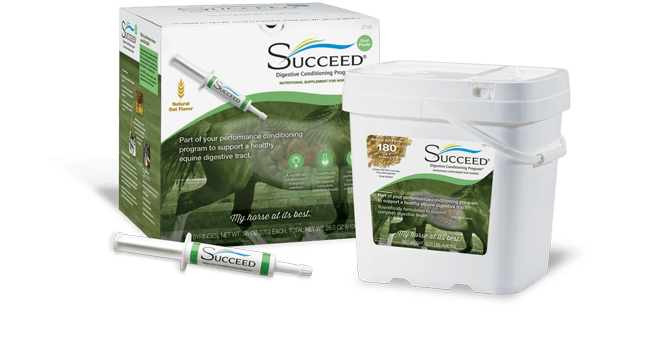 The SUCCEED difference is in the oats we use and in our precise and intentional processing designed to retain high concentrations of the very beneficial beta glucan. We believe in creating the best supplement possible for your horse to consistently perform at its best as a result of total internal wellness – despite the challenges of modern care, training, and competition. Subscribe to the blog to see parts 3-5 of What Goes In. In Part 3 we’ll be exploring oat oil and its patented process for retaining polar lipids.